Normally Surreal: Free Your Mind! Hello all! I hope everyone's weekend was more fantastic than the thought of marmots skiing over piles of glitter! 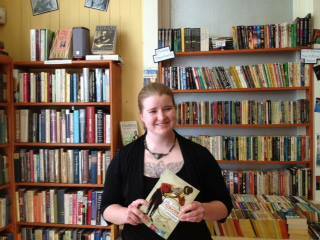 Well yesterday I had my first book signing for Life is a Circus Run by a Platypus at Monkeyboy Books! Thank you to everyone who came out to get their copies of the book signed and to all the new readers I was able to meet! Also thank you to Marina for letting me take up a corner of your shop for this event! 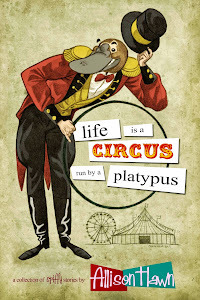 Also Auntie's Bookstore has also started carrying Life is a Circus Run by a Platypus!!! So if you happen to be hankering for a copy, you can find it there now too! 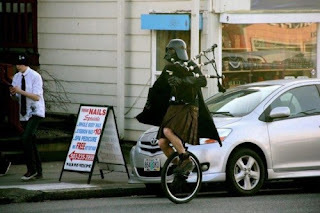 And now for something completely different; Darth Vader in a kilt, on a unicycle playing bagpipes! I had an interesting interaction today. I was buying groceries, a task that requires me to listen to "Eye of the Tiger" just so that the task of buying tomatoes feels more epic. I should note that I was wearing a tank top today because Spokane has suddenly decided that Summer is happening, despite our random May "spit goes clink" cold snap. If you will note the picture above... I have some artwork, and by some, I mean quite a bit. I was rocking out in the produce section, my headphones in but not turned up super loud, when I heard this lady right next to me say to her husband, "Look at her and those tattoos, I bet she doesn't even have a job. Such a shame that someone so young messed up their life." I paused my lettuce perusal and turned to the woman and gave her the most sickeningly, sugary sweet smile I could muster and said, "Actually, I'm a social worker, and I've had steady jobs since I was 17. The tattoos just help me weed out the people who are too prejudiced for me to hang around. Oh, and by the way, I have a 4-year degree, so yeah, I've really screwed up my life." The woman's eyes bugged out and her mouth dropped open enough that I could see the half masticated piece of gum she had been spitefully chewing, and so I continued in the brightest most cheerful tone I could muster, "Yeah, I may look like a cheap romance novel to you on the outside, but on the inside I'm Shakespeare. Have a good day, ok cupcake?" As I walked away I could hear her husband chuckling. Sadly, this is not the first time something like this has happened. I once was asked if I was a Satanist, which is entertaining considering the fact that I have "Psalm 23:4" scrawled on my shin, a giant angel on my chest and two other crosses. I just looked at the man who asked and said, "Yep, better keep an eye on your chickens. You never know when I might need a sacrifice." I have also been asked, "When you get old, aren't you going to hate the way they look?" To which I normally respond, "When you get old, are you going to look like a beauty queen?" 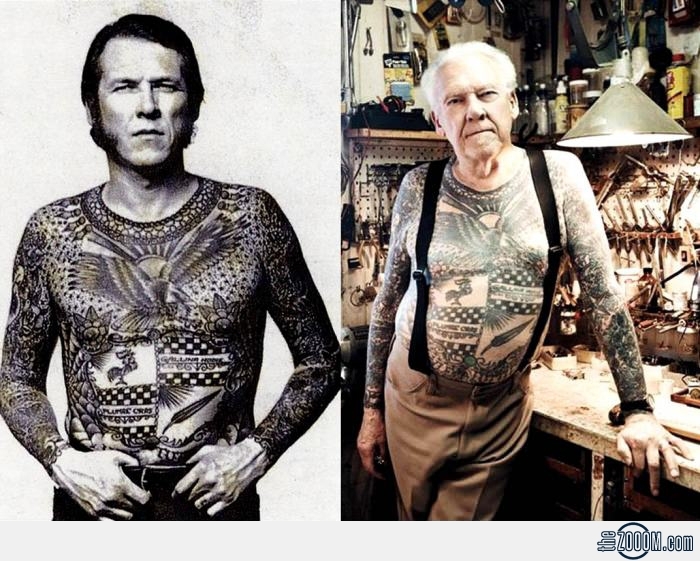 Plus, if I can look half as awesome as this dude does at 80, then I don't think I will have any problem with it! I realize that not everyone likes tattoos. That is fine. 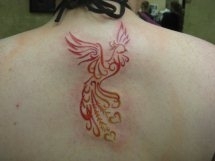 The solution to that is that if you don't like tattoos, then don't get any. I also realize that some employers are not fans of tattoos, which is why I get them in places that I can cover them easily. It is just plain sad, though, when someone looks at a wonderful piece of art (and I'm going to say it, my tattoos are pieces of art etched by true artists) and thinks that someone's I.Q. or capabilities are somehow diminished because of its existence. Then I can understand where one might think the person sporting this piece of awfulness might be a few fries short of a Happy Meal. 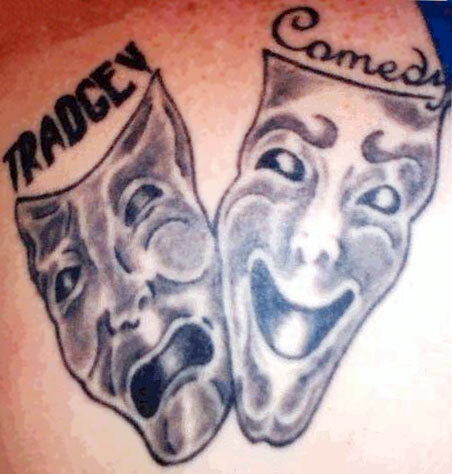 Not all tattoos are created equal. The world is full of so many other important issues and questions that we could be spending mental energy on (like how do you peel a pomegranate without making a gory mess out of it? ), so why focus any energy on making negative assumptions? People are people, some people just resemble the Louvre more than others. As always, feel free to follow my exploits on Facebook, Twitter and Goodreads! PS- I miss your snarky comments. Maters, Taters and Grits, oh my! War is Upon Us... Oh, and There's a Contest Too!